Buenos Aires is the capital of Argentina, and is a popular tourist destination for all types of travelers. There are plenty of hostels and affordable accommodation hostels around the city. If you're traveling alone, there are plenty of hostels that organize activities and events for guests to ensure some interactions among visitors. The hostels are spread throughout the city, but many are concentrated in San Telmo. This is a nice area with plenty of restaurants, cafes, and entertainment. It's also where you'll find the most affordable accommodation. How much do hostels in Buenos Aires cost? 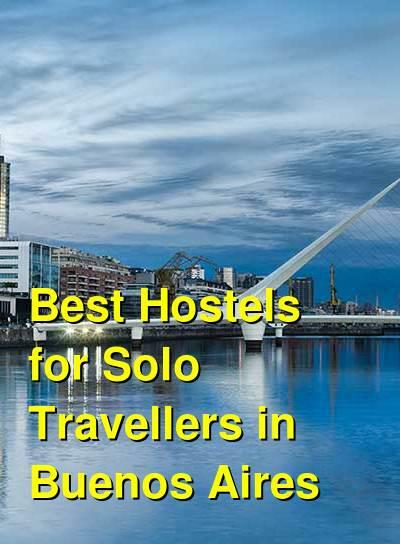 America Del Sur Hostel Buenos Aires is one of the top rated hostels in South America. It's a popular favorite among backpackers, solo travelers, independent travelers, and groups. The hostel has all kinds of modern amenities that guests can enjoy, from the modern decor to the comfortable furnishings. It's conveniently located in the San Telmo district, which is one of the oldest areas in the city. It's within walking distance of many popular destinations including Plaza de Mayo, 9 de Julio Avenue, Puerto Madero, and Plaza Dorrego. It's also very close to most forms of public transportation. The hostel is great for people traveling alone. They offer a range of room types including single, double and twin private rooms. There are also triples, quads, and four person dorm rooms available for those on a tighter budget. The hostel is a great place to hang out and meet other guests. There's a television room that has a supply of movies that you can choose from. There's also a barbecue area and several other smaller common areas. The staff is wonderful and they go out of their way to make sure you have a good time. They can help you arrange any number of tours and activities and can help you with any travel related questions that you might have. If you're traveling alone, this is a great place to stay and meet other travelers. This hostel is located in an old Buenos Aires residence that dates back to the 1900s. The owners have managed to take the older building and bring it to life with eclectic furnishings and a fun vibe. The hostel is conveniently located in a traditional Buenos Aires neighborhood. It's a ten minute ride by subway to the town center and is near Palermo and Recoleta. The hostel is near many interesting restaurants, bars and cafes. There are both private rooms and dorms available. Single, twin, double, triple and quad private rooms are available. There's a six bed dorm as well for those on a tighter budget. The hostel has several great common areas including two patios and a large terrace with a barbecue area. This is a great place to relax and unwind from your time exploring the city. This hostel is a great option for people looking for a relaxed atmosphere in a fun setting. The hostel is located in an old building that has a lot of character. It's very close to Casa Rosada, Obelisco, and the San Telmo area, where you will find many shops, cafes, and an impressive craft fair. The hostel appeals to travelers from around the world, so you will meet a diverse crowd of interesting travelers. There are large common areas where you can enjoy watching movies or just swap travel stories. The hostel also has a library and book exchange as well as a pool table. Breakfast is served every morning and includes croissants, bread, cereals, juice, fruit, and coffee. That staff can recommend any number of activities for guests including live music, tango shows, Spanish classes, and the best bars. If you're looking for a hostel with a mellow atmosphere and plenty of places to chill with other guests, then this is a good option. A range of room types and levels are available to meet all budgets and travel styles. Private rooms range in size from singles to quads and dorms sleep between six and eight. Hostel Estoril has been established in Buenos Aires for over ten years. It's a locally owned business that offers a personal touch. The hostel is found in a 100 year old building and is surrounded by many restaurants and cafes. It's easy to access many different destinations including Florida Street, the Obelisk, the Colon Theater, Congress, the Presidential Residence, La Boca, San Telmo, Recoleta, and more. Public transportation is easily accessible from the hostel. The hostel has a bar on its rooftop that is a great place to hang out with other guests. They serve breakfast every morning and can help you arrange any number of activities including Spanish lessons, walking tours, and dance lessons. The common areas are comfortable places to relax with large sofas and plenty of dvds. If you're traveling alone and looking for a fun place to stay, then this is a good option.